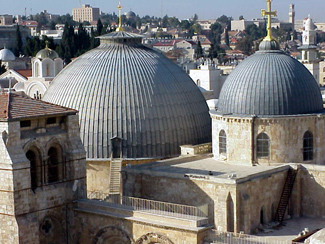 The Church of the Holy Sepulcher, called the Church of the Resurrection by the Greek Orthodox, is the most sacred space in Christendom. The New Testament gospels indicate that Jesus was crucified outside of the walls of Jerusalem and then was buried in a garden nearby. This church houses the site of the crucifixion and that of the tomb of Jesus. This area was venerated by Christians in the first century A.D. However, the Roman emperor Hadrian (A.D. 117–138) turned it into a place of pagan worship. This area was "rediscovered" and cleared when Constantine's mother, Helena, visited Jerusalem in A.D. 326. By A.D. 335 a Christian Church was built over the area. Although destroyed by the Persians in A.D. 614 — it was rebuilt. In A.D. 1009 it was again destroyed by Hakim. The crusaders rebuilt the church and the basic structure that one enters today, basically follows the plan of the Crusader church.